Sometimes, you just need a little something sweet; Dr. Shijoe Mathew, an Ayurvedic doctor at The Alternative Healthcare, knows this all too well. Thankfully, it's perfectly OK to have some dessert within an Ayurvedic diet — preferably between 10am and 12pm, when your digestion is at its strongest. In fact, a little sugar is really effective for taming Vata. Dr. Mathew shared his split mung dal pudding (payassam) recipe with me, and I'm so happy to share it with you. I love this traditional Indian-Ayurvedic recipe — it's the inspiration behind my Sunshine Yellow Porridge in East by West, which is more of a breakfast than a dessert. Payassam is a traditional Indian and Iranian dessert, which is often made with rice, but can be made with a variety of other grains and pulses. Here, Dr. Mathew uses mung dal, which is also one of my favourite ingredients, as it's both beautifully nourishing and easy to digest — the Ayurvedic jackpot. Heat ghee in a heavy-bottom pan or in a pressure cooker. Fry raisins until plumps, then drain and set aside. Add cashews and fry until golden brown, then drain on a paper towel and set aside. Add the split mung dal in the same ghee and fry for a couple of minutes until it turns a little golden brown. Add 3 to 3.5 cups of water and bring to a boil. Reduce the heat and allow to cook for about 10 minutes or for one whistle of the pressure cooker. Then, mash the mung dal with the back of a spatula and set it aside. Meanwhile, place the jaggery and 1 cup of water in a pan over medium heat, stirring consistently until the jaggery is fully melted (almost the consistency of honey). Transfer the jaggery syrup into your mashed dal and cook for a few minutes over medium heat. Add the semi thick coconut milk, mix well and bring back to a boil, stirring continuously over medium heat for about 10 minutes or until the mixture thickens. Finally, add the thick coconut milk and cook for a minute over low heat, making sure not to reach a boil. Take off the heat and keep stirring until the milk is well mixed. 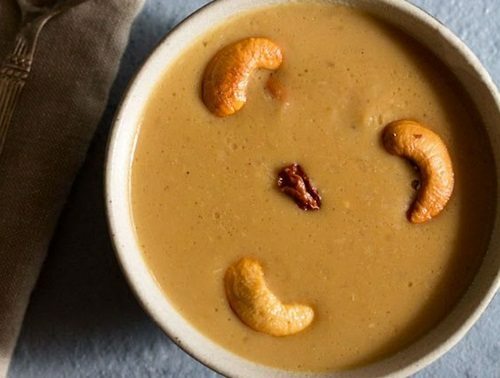 Add the cumin, dry ginger and cardamom and mix well, before adding the fried cashews and raisins, and half a teaspoon of ghee (optional). The delicious payassam is ready to serve. Serve warm or cold and enjoy. Jasmine's Tip: try the Sunshine yellow mung dal porridge in East by West page 47.